Celebrating the life of Charles Albert James, Sr.
Obituary for Charles Albert James, Sr.
Charles Albert James, Sr. was born on April 13, 1923 in Kingston, New York, son of Leanora Clerk James and Fred James. They moved to Newark, New Jersey where he attended and graduated from Southside High School. Charles was a veteran of the United States Army having served with Company B 730th Military Police Battalion. He was honorably discharged on October 13, 1943. He worked at Ivers-Lee (now known as Becton Dickinson) for many years. He retired as a Supervisor from Walter Kidde in Newark. Charles was joined in holy matrimony to the love of his life, Hattie Brown. He would adopt her daughter, Dominique. Charles was a former Exalted Ruler of George E. Cannon Lodge No. 828 in Vauxhall, New Jersey. He was also a Master Mason through Golden Rule #50 also in Vauxhall. His favorite sport was basketball. In his leisure time, he enjoyed playing golf with his friends. A Democrat, he loved having political discussions with his Republican son, Charles, Jr. 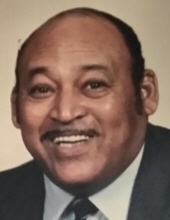 Husband, Father, Grandfather, Charles Albert James, Sr. known as Carlos and CJ passed away on Wednesday, September 26, 2018 at Delaire Nursing and Convalescent Center in Linden, New Jersey at the age of 95. He was predeceased by his parents, Leanora and Fred James; three brothers, Joe, John and Fred James; his father-in-law, James Brown and a sister-in-law, Patricia Brown. He leaves to cherish fond memories, his beloved wife, Hattie Brown James of Linden, NJ; a son, Charles Albert James, Jr. of Phoenix, AZ; a daughter, Dominique Brown-James of Linden, NJ; a granddaughter, Katherine James; his mother-in-law, Almeta Brown of Linden, NJ; four nieces, Charlene Massey of Fayetteville, NC Sade Brown of Riverdale, GA, Courtney Reed of Las Vegas, NV and Angel Nelson of Linden, NJ; a great niece, Ebony Massey both of Fayetteville, NC; two great great nieces; two brothers-in-law, James and Medford Brown both of Linden, NJ; a sister-in-law, Mornita Brown; a long-time friend, Fletcher Gaines and a host of other relatives and friends. To send flowers or a remembrance gift to the family of Charles Albert James, Sr., please visit our Tribute Store. "Email Address" would like to share the life celebration of Charles Albert James, Sr.. Click on the "link" to go to share a favorite memory or leave a condolence message for the family.